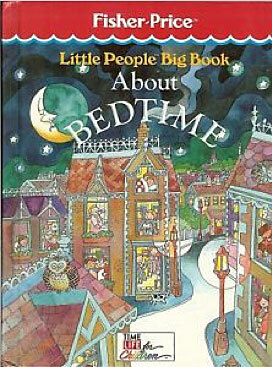 Number Little People Book - "About Bedtime"
Description: Fisher-Price and Time-Life For Kids teamed up to produce several different Little People Books. These books include a 64-page hard cover book accompanied by a 24-page activity book. The paperback activity book has several different bedtime related coloring pages, activities (dot-to-dot, mazes, matching game, etc. ), plus instructions for parent and child crafts. FPT19662 - 64-page hardback book titled "About Bedtime". The book cover has a red Fisher-Price awning bar across the top and is marked "Fisher-Price" in white in the center. The book is marked "Little People Big Book" in yellow under the Fisher-Price awning bar. The bottom of the cover has a white rectangle marked "TIME LIFE for Children". Measures 11-1/4" tall, 8-3/4" wide. FPT19639 - Soft cover Little People Activity Book titled "About Bedtime". The book has a picture on the cover of a city at night time with Little People children in the windows doing different activities. Published by Time-Life Books, Inc., produced by Parachute Press, Inc., Written by Linda Ward Beech, and Illustrated by Shirley Beckes. Measures 10-15/16" tall x 8-7/16" wide. FPT19663 - Mint (unopened) hardback and activity book set.